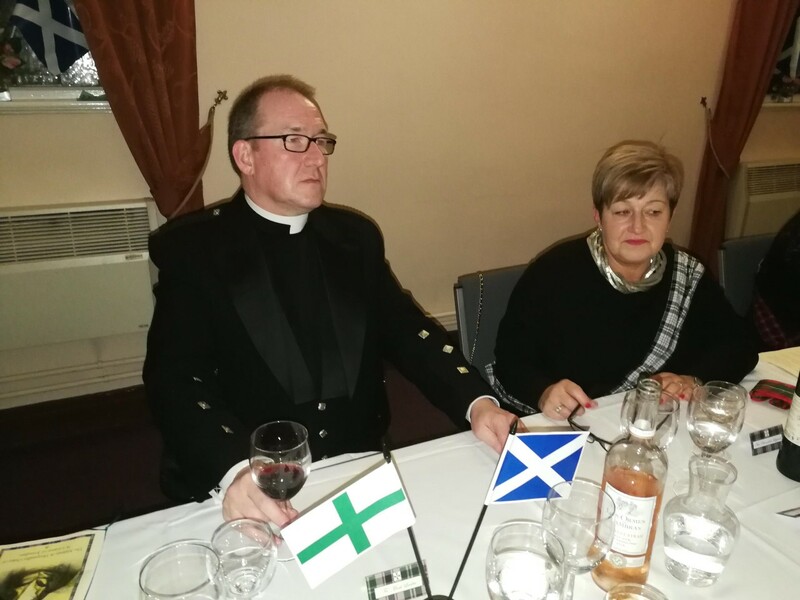 Once again this year the Grand Priory of Great Britain kept a Scottish themed evening, raising funds for SUROL, their charity in Sri Lanka (under the patronage of Cardinal Malcolm Ranjith) which assists those affected by leprosy. 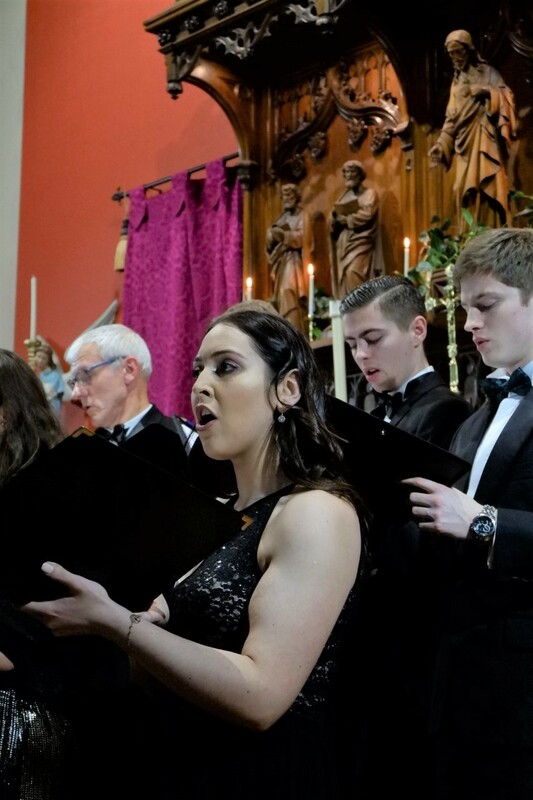 Carol Concert this year took place last Saturday at the church of St Catherine Labouré in Lancashire. As ever, the Octavius Choir put on a splendid performance. This year, raising £1,500. Bringing the total for these concerts to £31,500. 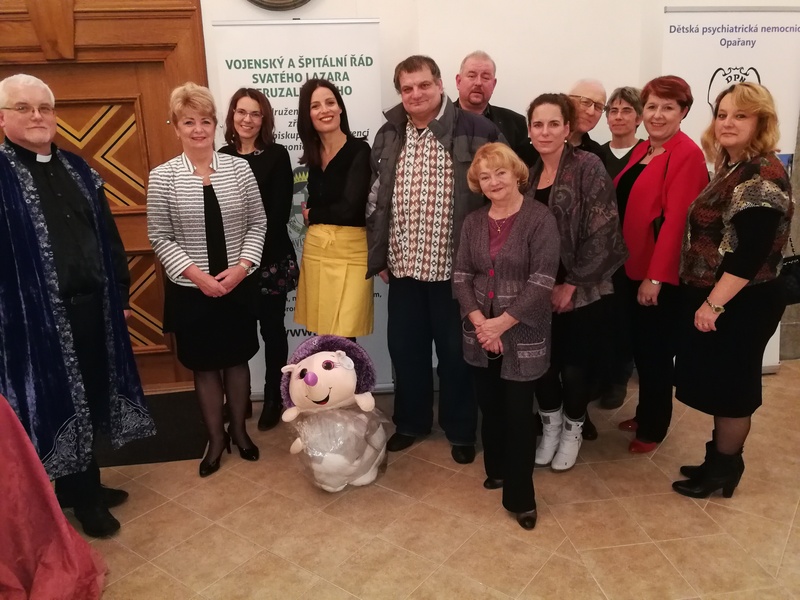 November 7, 2018 Children's Psychiatric Hospital in Opařany. Together with directress MUDr. 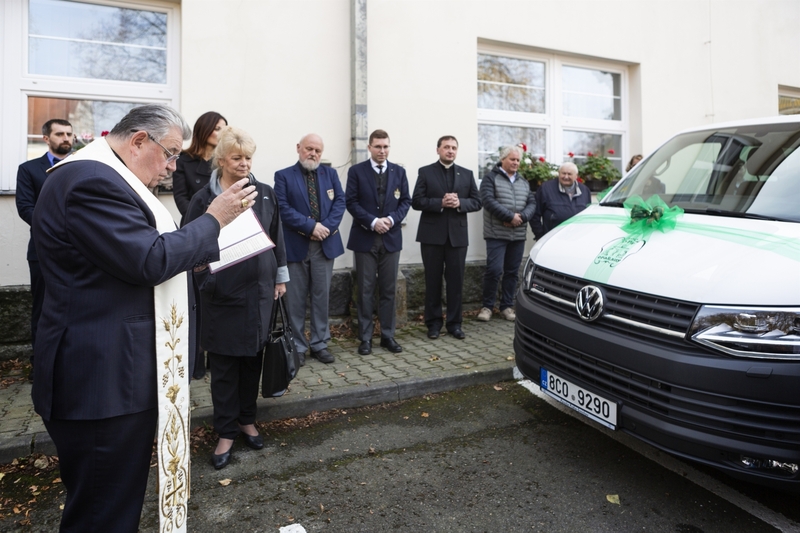 Iva Hodková and the representatives of the Order looked at the hospital premises and then blessed the new Volkswagen Transporter, which the hospital bought thanks to the gifts of the benefactors. 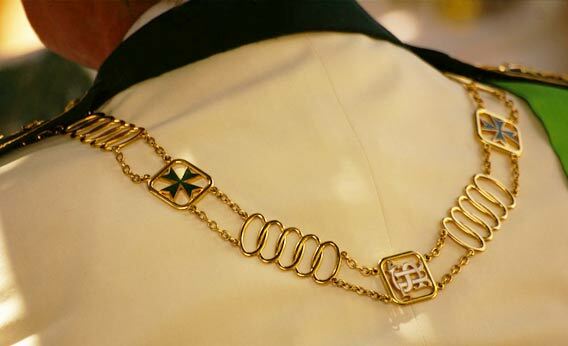 The purchase of a new vehicle for the Hospital also contributed financially to the Grand Priory of Bohemia of the Military and the Hospitaller Order of St. Lazarus of Jerusalem, who has been cooperating with the hospital since 2005 and helped with leisure and social therapy programs in particular. 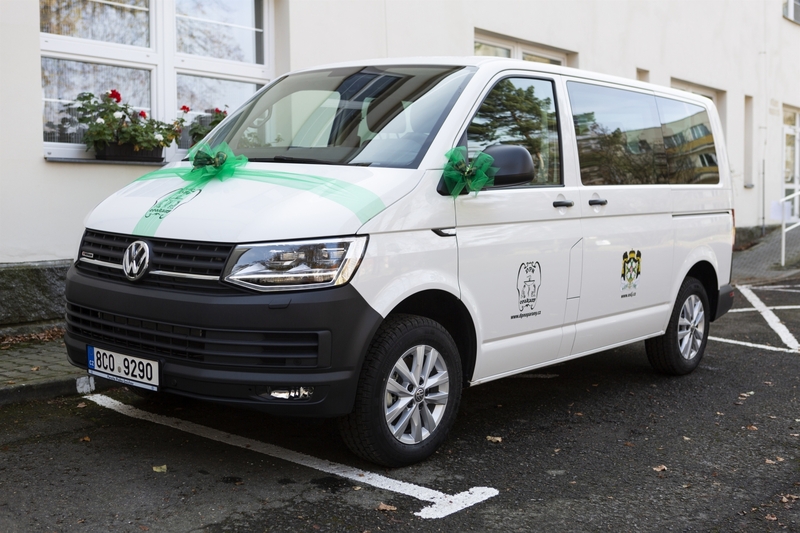 The minibus also contributed to Stavitelství Řehoř, s.r.o. The Children's Psychiatric Hospital in Opařany is the largest hospital for children with psychiatric diagnosis in the Czech Republic. It provides health services to children with acute problems, as well as those whose illness requires longer and repeated hospitalization. 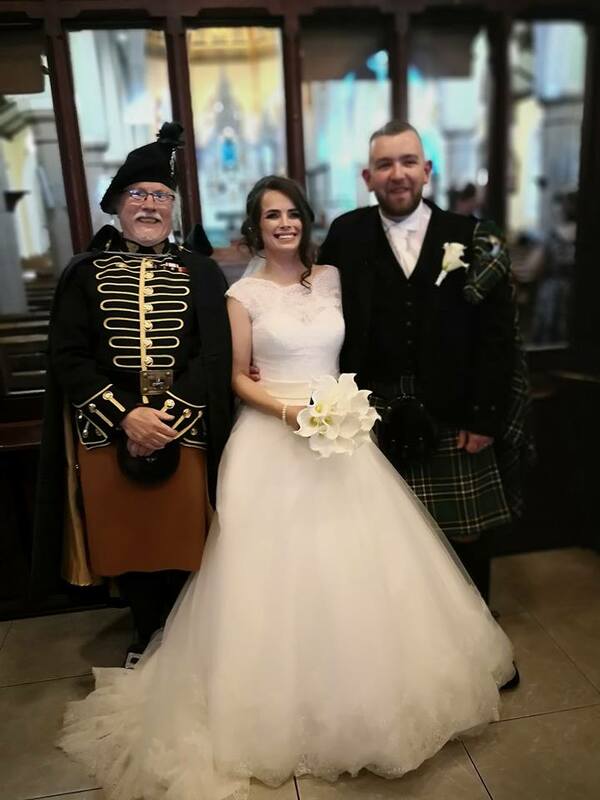 I had the pleasure of playing my pipes at a wedding this afternoon in Coatbridge Scotland. I haven't played at a wedding for a number of years so it was an event for me . The money from the afternoon goes to a charity I have been supporting for many years. SUROL is a Catholic Charity which gives relief to those suffering from leprosy (Hansons Disease) and their families in Sri Lanka. 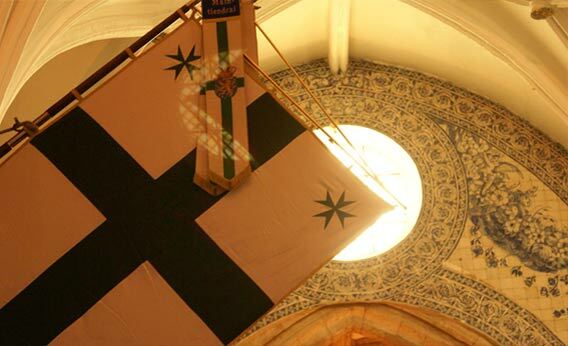 The Military and Hospitaller Order of St Lazarus of Jerusalem Grand Priory of Great Britain has adopted SUROL as our main Charity and so far we have gifted £110k to them. The donation from Colette and Steven MacBride today will help to cure 3 people from leprosy. God Bless you and I wish you a long and happy life together. We are a very small group of Christians 30 in number in Great Britain we have no connection with other green cross organisations. St Joseph's Hospice is one of the charities supported by the Order in Great Britain, working with Archbishop Malcolm McMahon of Liverpool. The hospice was founded by in the Archdiocese by Fr Francis O'Leary, caring for those with terminal illness. This first small project is the first of many as we work with this local charity, engaging in supporting the life of the Church in local dioceses. A charity fashion show of the Korunka Luhačovice Foundation took place in Luhačovice (Czech republic). 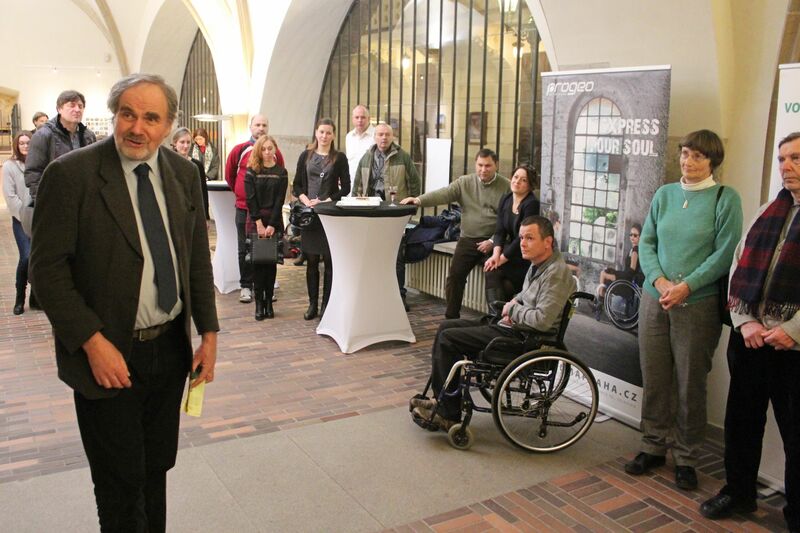 The Commandery Moravia of the Grand Priory of Bohemia donated CZK 23,900 (ca 930 €) to the Foundation. The Korunka Luhačovice has long been helping the sick and handicapped children. 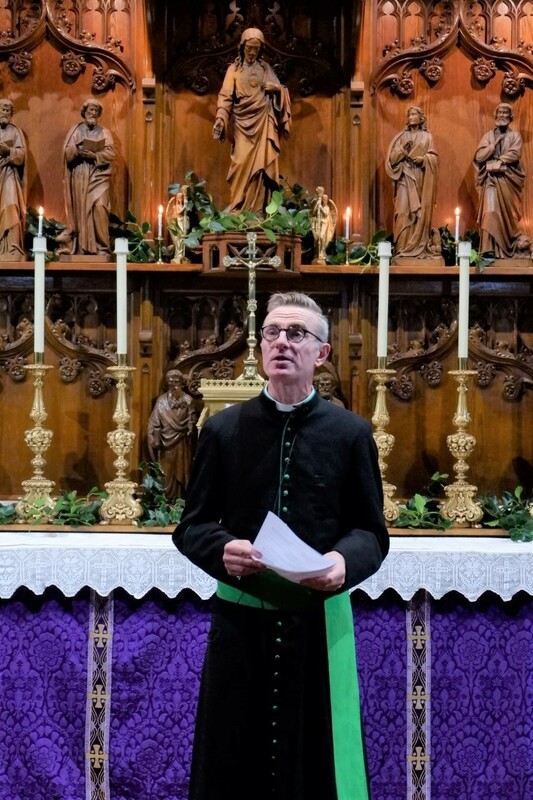 The Grand Priory of Great Britain is sponsoring the Summer Conference in Chavagnes International College and Studium this year, where Order Chaplain Fr Mark Lawler is the Chaplain and also one of the speakers (G K Chesterton as his subject). Although set in the beautiful and historic Vendée in the west of France, the College classes are taught in English (for boys of secondary age and now also at degree level at the Studium there). The Conference is also in English. 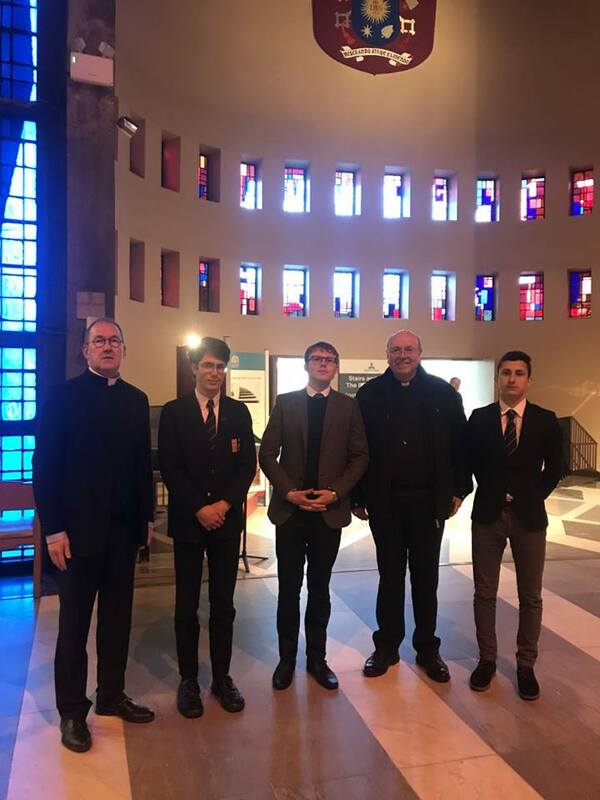 The Grand Priory is sponsoring the College Conference because it is a place of truly Christian education, where the Faith is an integral part of daily life and the boys are taught to embrace the Faith with both joy and courage. It is also hoped that those attending the Conference might be a good audience among which to promote the work of the Order - approaching people already interested in their Faith. 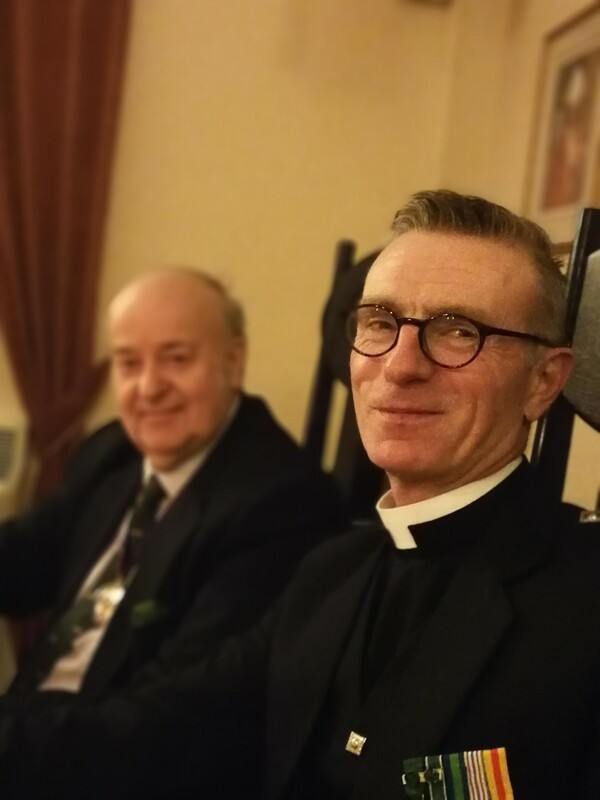 The Order will have an active presence at the Conference, with our Grand Prior, Chaplain General and at several other members - and prospective members - hoping to be present. Joseph Pearce will be the Keynote Speaker - “The Catholic vision of JRR Tolkien” - at the Summer Conference in Chavagnes, France, this year. 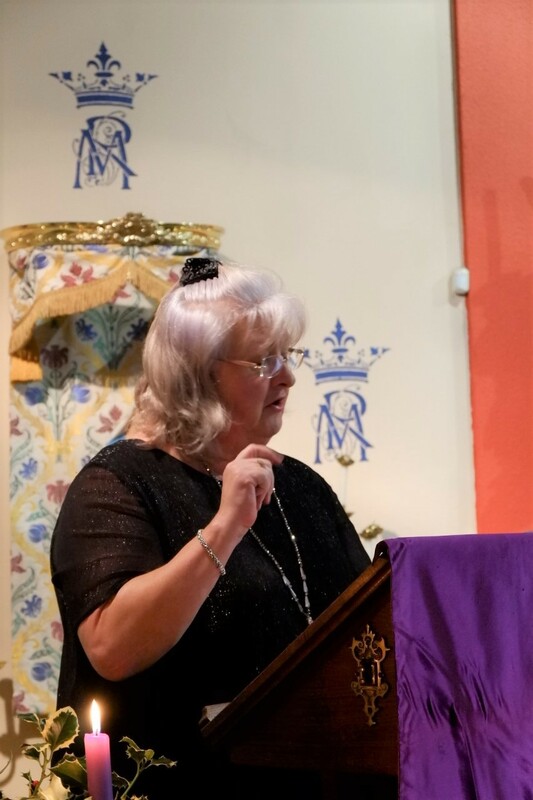 Now in its third year, the Conference has proved to be a lively and interesting event in a convivial atmosphere, with daily Mass and visits to local places of Catholic interest. 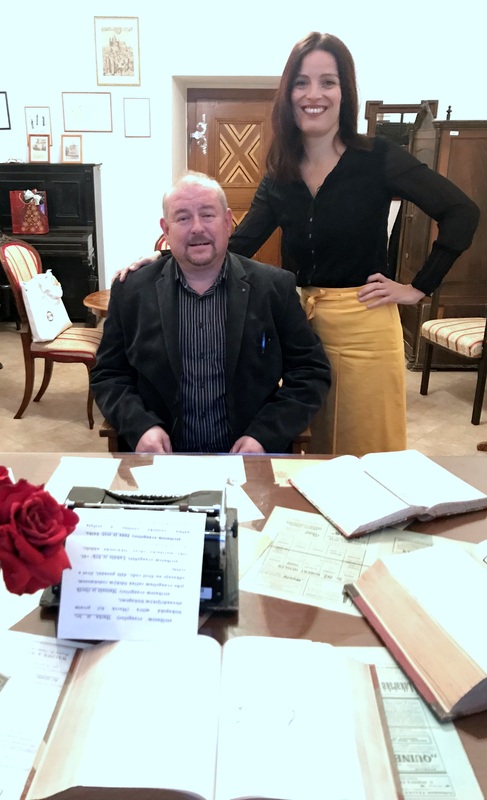 JOSEPH PEARCE is a senior fellow at The Cardinal Newman Society and editor of its journal. He is a senior contributor at The Imaginative Conservative and senior editor at the Augustine Institute. Up until recently, Director of the Center for Faith and Culture at Aquinas College in Nashville, Tennessee he was previously on the staff of Thomas More College of Liberal Arts in Merrimack, New Hampshire, Ave Maria College in Ypsilanti, Michigan and at Ave Maria University in Ave Maria, Florida. His books include biographical works on C.S. Lewis, Shakespeare, Tolkien, Chesterton, Wilde, Solzhenitsyn and Belloc. He is a visiting professor for the Studium’s new Liberal Arts degree being launched in September 2018. 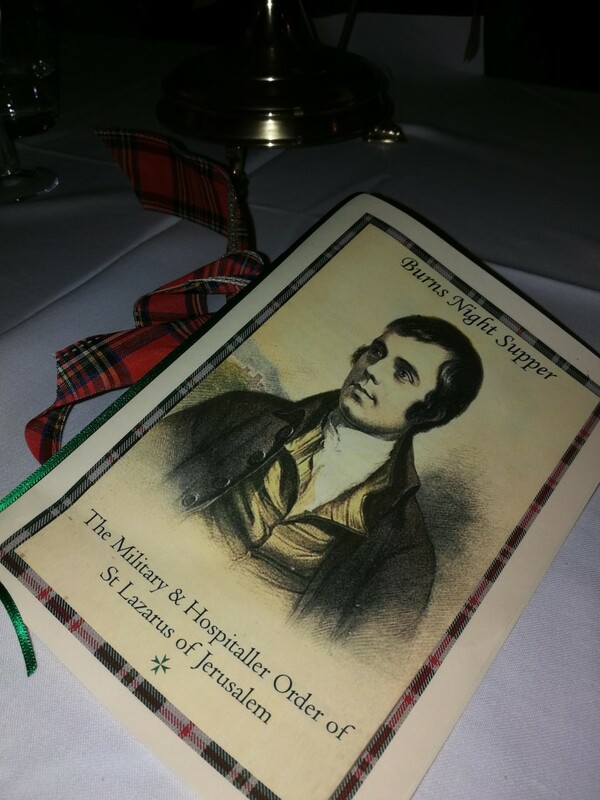 A very well attended Burns' Night Supper took place (a little after the poet's birthday - we take it as a moveable feast) at Leyland in Lancashire (not quite Scotland but far enough North to be well on the way). A very enjoyable evening, raising £600 for the charitable causes of the Grand Priory of Great Britain. Attended by members and friends of the Order, as well as some prospective postulants. Thank you to everyone who came along. 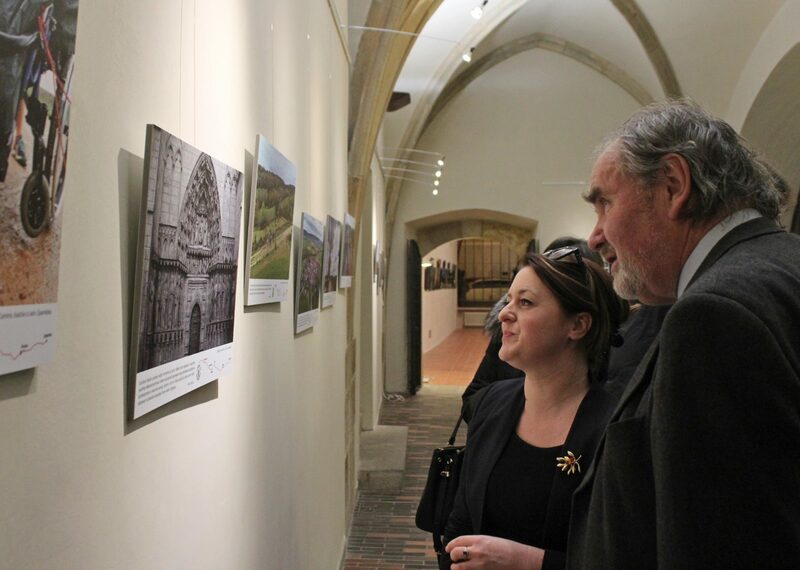 The exhibition of photos from "Camino on wheels" in the crossing hall of Prague Karolinum was opened by a festive opening on Monday 5 February. "Camino on wheels" was a pilgrimage of wheelchair-bound Honza Dušek and his friends to Santiago de Compostela. The Grand Priory of Bohemia was the main patron of the pilgrimage. The attendant was first welcomed by the organizer "Camino on wheels" and exhibitor Petr Hirsch. 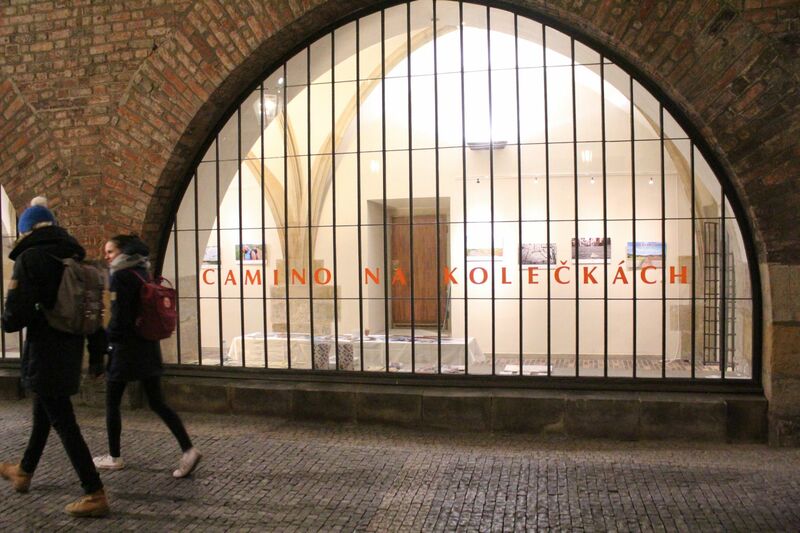 After the vernissage, the discussion with Honza Dušek and Petr Hirsch followed with short films and photographs exhibition that consisted of 29 photographic panels documenting the story, joy and sorrow, each day of "Camino on wheels". Honza Dušek and Petr Hirsch are from May 2017 companion members of the Order (CompLJ). 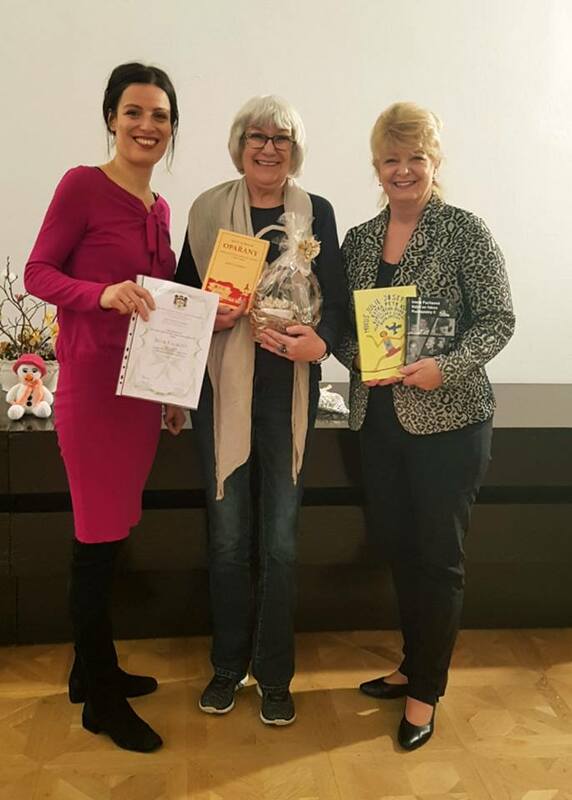 Reading for child patients from the Children Mental Hospital in Opařany (south Bohemia), with writer Irena Fuchs. 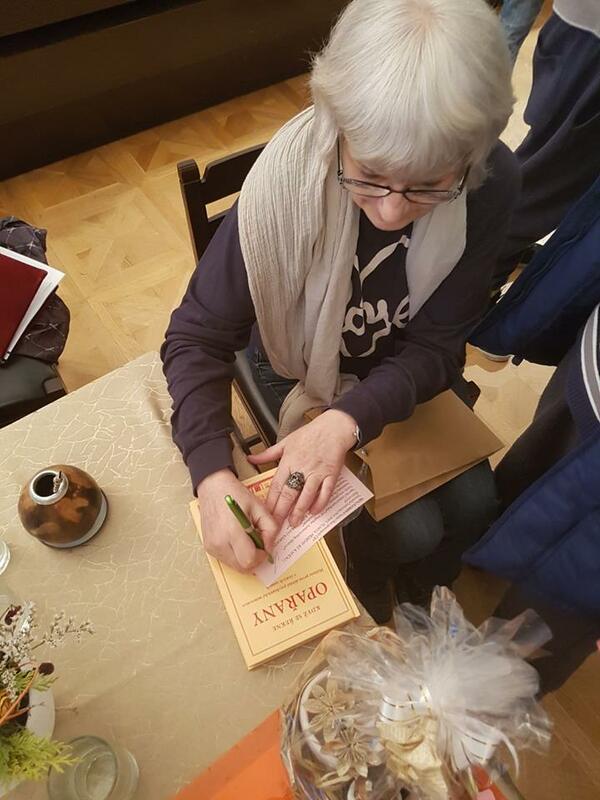 “Reading in Opařany” is a permanent charity activity of the Grandy Priory of Bohemia – famous actors and other artists read short stories to patients of Children Mental Hospital in Opařany. This has been an excellent evening over past years with all the traditional Scottish ceremony and traditions associated with the evening - though you don’t need to be Scots to come along! which is terrific value considering all you get. The event is to raise Charitable Funds, so come along and support it whilst having a great evening’s fun. or via the Secretary, Chev. Anthony Dickinson. Dress: - Black Tie and Dinner Jacket - or suit and tie. On Tuesday December 19th , a traditional Advent concert took place at the Children's Psychiatric Hospital in Oparany. Musica da Chiesa, a pair of top musicians, P. Jaroslav Konečný and Tomas Najbrt, who have dominated a wide range of different historical musical instruments, came out. Their music was a pleasant pre-Christmas experience for the hospital patients and other guests. 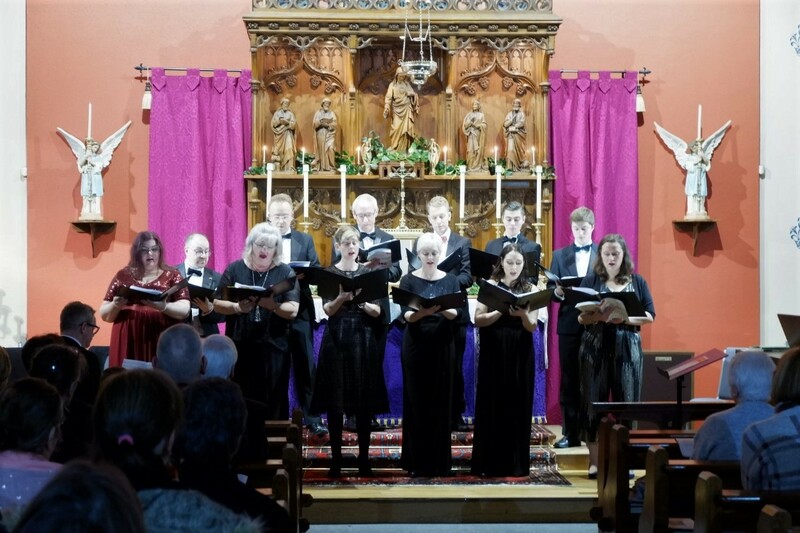 The concert was organized by the Grand Priory of Bohemia of the Military and Hospital Order of St. Lazarus of Jerusalem. 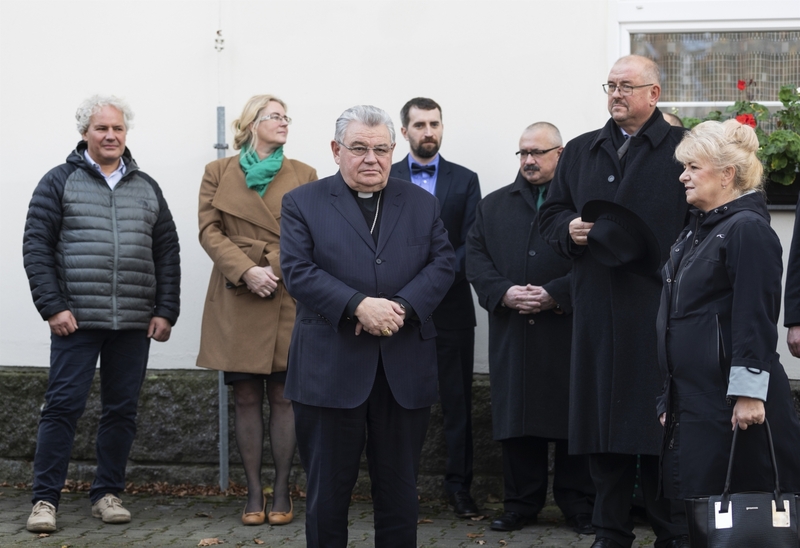 The Grand Priory of Bohemia cooperated with the Oparany Hospital for 11 years and among other things it helped with organizing concerts, reading for children and a Christmas bazaar to support the hospital. This year's concert was already the thirteenth in a row. 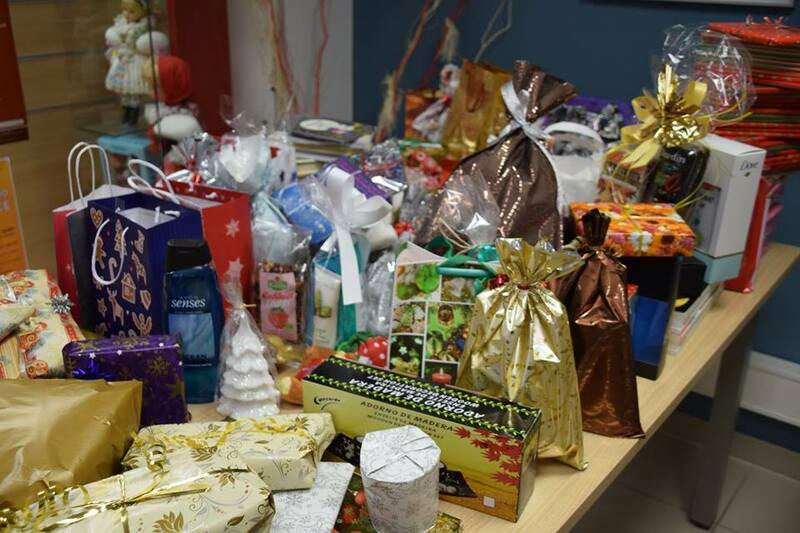 Lazarian Help, an organization established by the Grand Priory of Bohemia for charity activities, collected gifts for abandoned seniors at the time of Advent. More than 200 packages were earned. The gifts will be distributed through the civic association Korunka Luhačovice. TV Interview of Sir Nick Silverio, Knight of Saint Lazarus & founder of "Save Haven for Newborns" on EWTN, Catholic Network. About: A Save Haven for Newborns is charitable activity of the Grand Priory of the USA. A Safe Haven for Newborns is dedicated to reaching pregnant girls and mothers before they reach the crisis stage. A Safe Haven for Newborns began in response to the tragedy of infant abandonment in Florida. We see and read about abandoned babies all too often – it is heart breaking.The Safe haven law is a safety net for both the mother and the newborn infant. Instead of abandoning a newborn to an almost sure death, it allows mothers, fathers or whoever is in possession of an unharmed newborn, approximately seven days old or less, to leave them at a Safe Haven facility: Any Hospital, Staffed 24/7 Fire Rescue Station, or Staffed 24/7 Emergency Medical Service Station, with no questions asked, totally anonymous, free from fear of prosecution...... A compassionate approach which is saving lives. 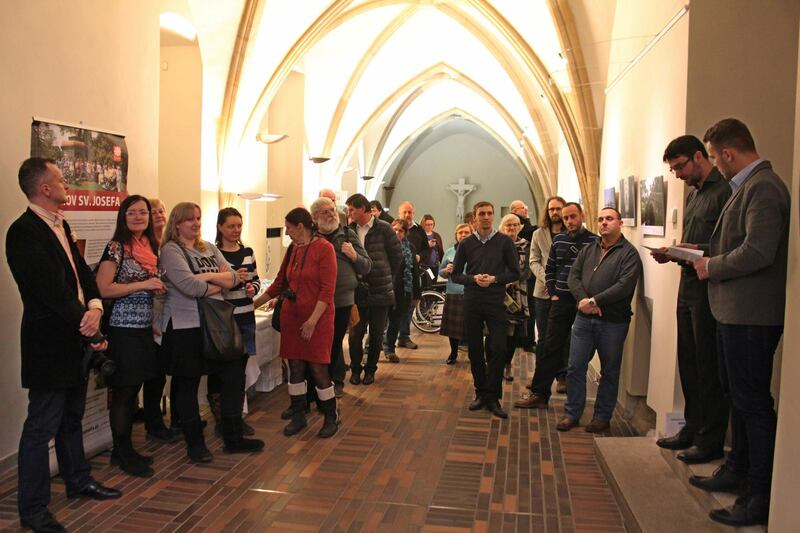 The exhibition of paintings and porcelain paintings by Academic painter Helena Schmaus Shooner, was officially opened at the Municipal Museum in Bechyně (Czech Republic) on Saturday 10 June. The exhibition is called "Fairy tales and Children". The exhibition also includes ceramics and paintings of children from arteterapeutical studios of Children´s Psychiatric Hospital in Opařany. Part of the proceeds from the sale of products will support this hospital. 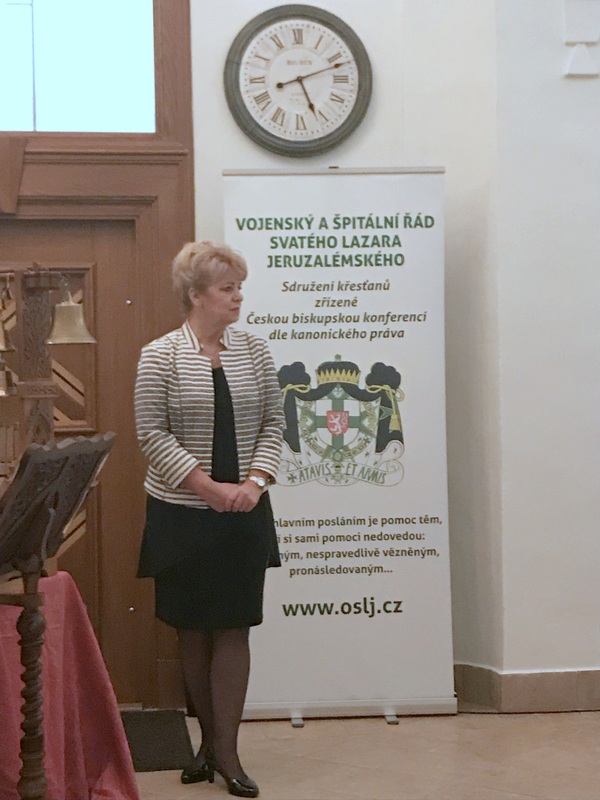 The exhibition is held under the auspices of the Canadian Embassy in the Czech Republic and with the support of a number of sponsors, including the Grand Priory of Bohemia of the Order of St. Lazarus of Jerusalem. Seven years after the earthquake that hit L’Aquila on April 6 th 2009, Italy cries again. This time for the victims caused by the tremor occurred on August 24 th 2016, which stroke the Centre of the country. 283 people lost their lives and 2500 lost their home, with towns like Amatrice partially destroyed and Accumoli and Arquata del Tronto completely razed to the ground. Castelluccio, Norcia, Montereale, Pescara del Tronto and Rieti are only ones among the many that were seriously damaged. 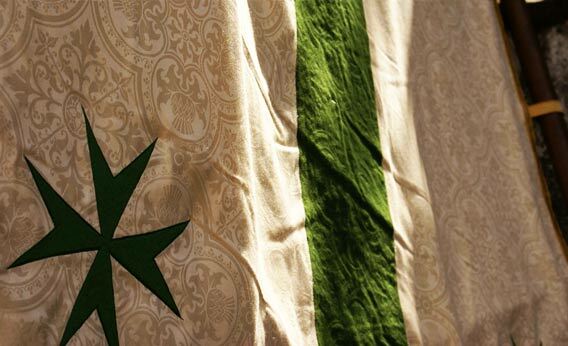 The Grand Priory of Italy, as it had already done in similar circumstances in the past, activated itself in order to gather funds and humanitarian aid. To the call, with great solidarity, answered: the Municipal Administration and the Citizens of Cis (a town in Trentino), the Parish and Pastoral Committee of Cis, the Fire Departments of Cis and Coredo, the Alpinos Group of Cis, the Voluntary Bodies of the Non Valley, the 118 Voluntary Body of Cles, the Citizens of Pergine, Trento, Non Valley, Sole Valley, Vicolo Vattaro, Stringo and Scurelle. 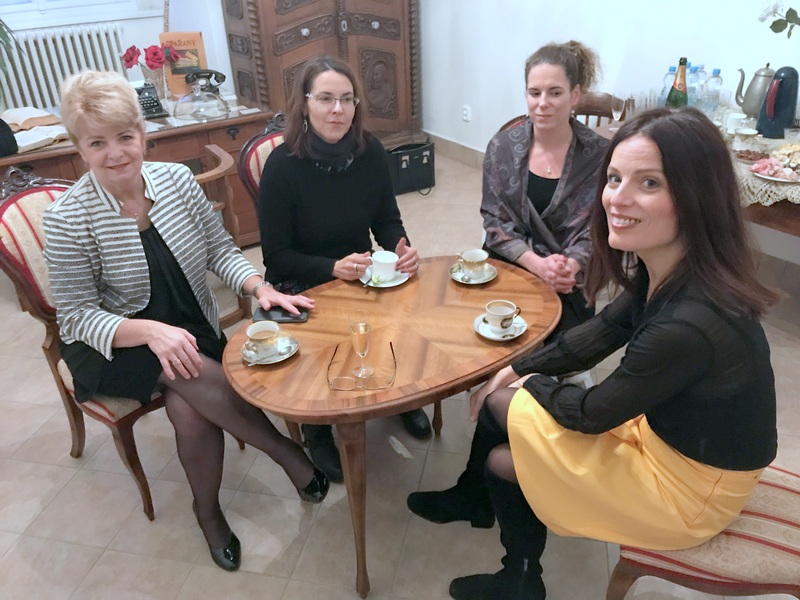 We managed to gather any kind of aid, together with an initial sum of about 18,000.00 Euros. On January 27 th , a first shipping, coordinated by our Hospitaller Dr. Massimiliano Ungaro and by the Fire Department of Cis Commander Oscar Betta, was delivered to some of Amatrice’s and Campotosto’s inhabitants. A second shipping was accomplished on February 5 th. 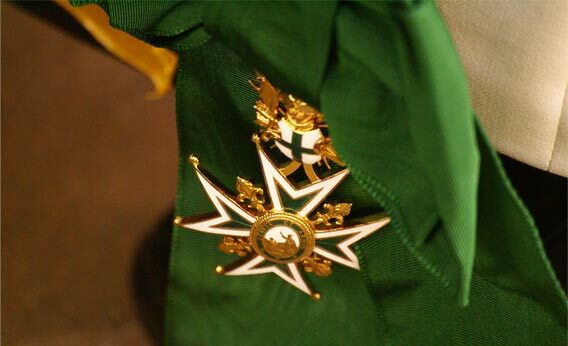 During the celebrations for Saint George, the saint patron of Cis, on April 23 rd , His Excellence Giovanni Ferrara, Grand Prior of Italy, publicly thanked the Municipal Administration of the town, as well as all the Voluntary Bodies and the Associations that made this remarkable act of solidarity possible, delivering them a certificate of merit and Grand Priory of Italy Medals of the Saint Lazarus Order. A highly succesful belated Burns Night Supper was held by the Grand Priory of Great Britain on Friday night. The venue was the conventual church of the Grand Priory, St.Catherine Labouré in Farrington in Lancashire. 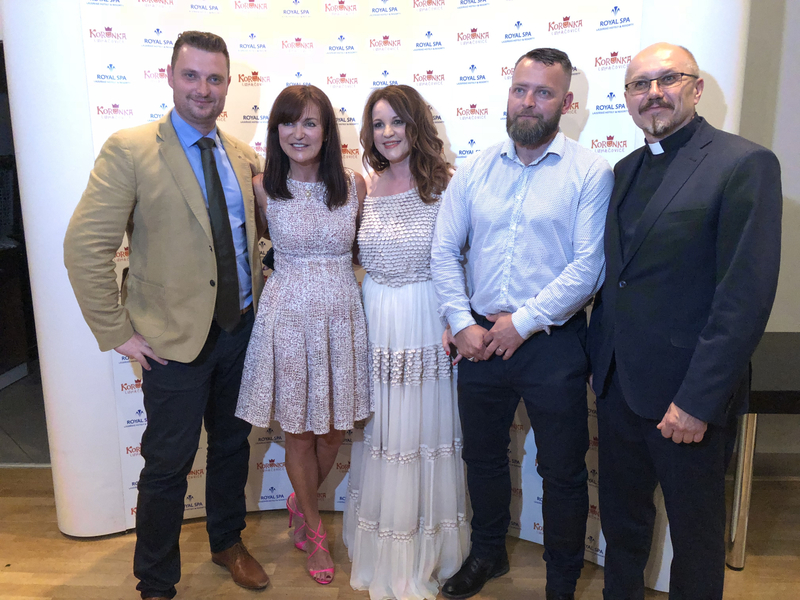 The event was held to raise emergency funds for our International Charity SUROL, who care for leprosy sufferers and their families in Sri Lanka,after more, hitherto unknown leprous patients, were discovered in the north of Sri Lanka. We raised over £1000 to help them. We continue to help those most in need.